"Powerful, captivating and inspiring! By the time you turn the last page, this book will have changed your life." "Not only is Persimmon Takes On Humanity a riveting read, but it also tackles one of the most important issues of our time with poignancy and heart." "Persimmon's tale takes the reader on an emotional journey that involves both heartache and exhilaration. But most importantly, the story is one of hope, for animals and humanity alike." "In taking on industries that exploit animals head on, Christopher Locke is as courageous as his indelible heroine, Persimmon, and has created a memorable novel that's a searing expose of some of the most oppressive, yet seemingly benign industries on the planet. People who have never explored these issues will, quite simply, have their minds blown, and even the most seasoned animal advocates will find themselves re-galvanized by this little raccoon and her big heart." "Rarely has a book so powerfully combined lovable characters, gripping adventure and a profound message of compassion. This story will make you laugh, cry and wish you were one of the team." "With a deep passion for his subject and a wonderful skill in storytelling, Christopher Locke opens an enlightening window onto the little-seen world of animals raised to serve human wants. Sometimes uplifting, at other times disquieting, it’s a thoughtful novel that teaches as it entertains. The adventures and tribulations of this unlikely band of raccoons, squirrels and other animals make for an engaging, page-turning read that is hard to put down." "With colorful characters and an enthralling story, Persimmon Takes On Humanity is not only enjoyable to read, but it might just change your view of humankind, and of the world that we have created." "Christopher Locke takes young adult fiction in a bold, new direction with his novel Persimmon Takes On Humanity. Anyone who loves animals will cheer Persimmon, the plucky raccoon, and her friends in their quest to rescue animals from industrialized cruelty. I hope that readers will pick up this book, learn from it, and perhaps adopt Persimmon’s valiant crusade as their own." 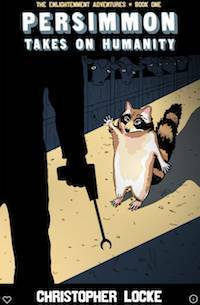 "The story of Persimmon, a raccoon on a mission, is at times magical and at times a searing view of the abuses animals endure, told from their own perspective. I’ll never look at animals the same way after reading Christopher Locke’s poignant portrayal." "Persimmon Takes On Humanity is the definition of moral imagination. Full of twists and turns, this book is the Animal Farm of our time. Highly recommended!" Sometimes following your dreams requires taking a leap of faith. That’s exactly what Christopher Locke did when he decided to write The Enlightenment Adventures™. After working for over a decade in the television industry, Christopher left his job to pursue his true dream of writing his own projects full time. When he came up with the idea for The Enlightenment Adventures, he dedicated all of his creative energy to this story. With the loving support of his wife (who edited the book, among many other things), he spent two years writing, rewriting and going through the at times overwhelming publishing process. The end result is Persimmon Takes On Humanity™ — the first book in The Enlightenment Adventures and the perfect combination of his two great passions in life: storytelling and animal issues. Christopher’s love of writing started at a very young age. Then, many years later when he read Fast Food Nation in 2004, he came to the life-changing realization that an essential part of being a compassionate person is treating all living creatures with equal respect. So, he subsequently became an avid animal advocate—enjoying a delicious plant-based diet, living a cruelty-free life, and volunteering for numerous organizations that make the world a kinder place. Persimmon Takes On Humanity is the beginning of a new, exciting chapter in Christopher’s life where he gets to pursue his passion as a writer, while also inspiring others to make compassionate choices in their lives.